Our skin has tiny glands that produce oil (sebum) needed for protection and to keep skin supple.The oil glands in dry skin do not produce enough, so the skin becomes dry and, in time, fine lines become small wrinkles. 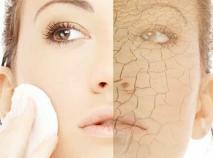 eye cream used daily helps prevent future fine lines or reduce existing ones. serum is highly concentrated and will add to the effectiveness of day and night creams. To avoid confusion, every two months we post one or two of each of the above products from the same brand. Organic cream for dry, dehydrated mature skin. Professional advice for people with dry skin.Products designed for dry skin use are renewed every other month by brand.Free expert advice for dry skin problems. Here you find cleanser and toner for dry skin,dry skin moisturizer and night cream,exfoliator,mask and eye cream for dry skin.